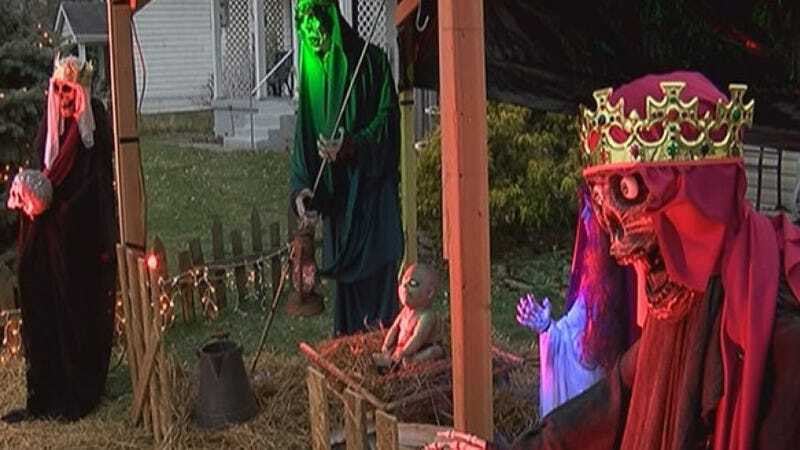 Folks, we have a new hero in our midst, and it's a Cincinnati-area man named Jasen Dixon who built an illuminated, zombie-themed Nativity scene in his front yard ... complete with undead baby Jesus. Alas, his neighbors were none too pleased with his handiwork. As Fox News reports, neither were Sycamore Township officials, who ordered Dixon to remove the display no later than December 26. The town "does not allow structures to be located in the front or the side yard to occupy more than 35 percent of the area. Also, the primary structure must be 3 feet from the street, and 6 feet from the house." "I've lived here for 15 years and I've never had a violation of any kind," Dixon said. "It's a holiday decoration. I know if it was a real pretty Nativity scene they wouldn't be saying anything." It is unclear if Dixon will fight the town, but when one person on his Facebook page urged him to keep the display up, he responded, "Danger's my middle name."